How to export my goods? 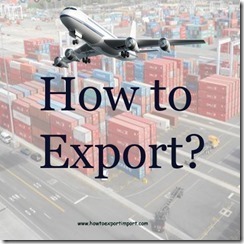 How to export your products? 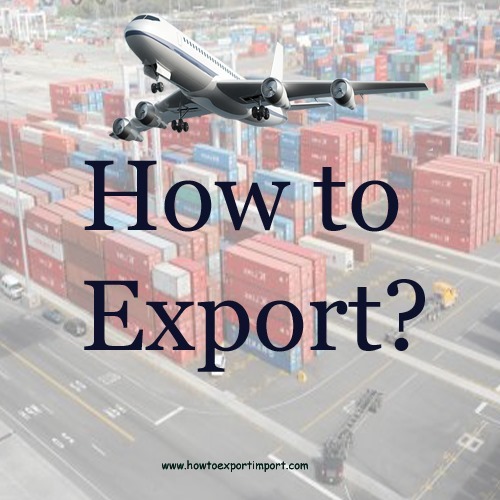 What are the procedures and process to export goods from your country to foreign Country? The following links explains about the process of export of goods, under Harmonized System chapter wise. This information is common to all countries, although the details are referred as per export procedures from India. These details are provided to have a basic idea about export process of each category of exports falls under Harmonized Tariff System chapter wise. Hence, the exporters may contact concerned authorities to collect accurate information to export their product. The above links explains about the process of export of goods, under Harmonized System chapter wise. This information is common to all countries, although the details are referred as per export procedures from India. These details are provided to have a basic idea about export process of each category of exports falls under Harmonized Tariff System chapter wise. Hence, the exporters may contact concerned authorities to collect accurate information to export their product. Biswanath Panda. : On 15 April 2015 Dear sir I am a new commer in this lmport export platform. I have already got the IE licence. Now I want to expand my business. In that connection please advised me about the necessary step for getting the upcomming business world-wide. I am looking for your kind advise. Yogesh : On 24 April 2015 As a beginner , how can i search a buyer of my product in overseas to export . ??? Mohd Umar: On 30 April 2015 Dear sir I'm a new commer in this Export Import Platform. I Get IE licence in between 10 days. After getting IE licence how I expand my businesses. In that connection please advised me about the necessary step for getting the upcomming business world-wide. I am looking for your kind advise. Forouz: On 18 June 2015 Dear Ms. I want to know about export of the handwork corchets like mat , blanket , ?... from Dubai. Arundeep Singh: On 28 August 2015 Dear Sir, I am already exporting in Nepal for last few years but I want to expand my business in other countries.Please advise me regarding that. saly: On 28 August 2015 Ho we can take EPCG Benefits? WHAT IS PROCEDURE OF IT? sunil ojha: On 30 August 2015 Dear Sir, I would like to export medicenal herb from India I want to know prosses of export of herbal row material. Ravi Kumar: On 27 September 2015 Dear Sir, I am new to this business and have got IE licence and want to export spices would like to know the export procedure and how can I get to know the potential buyers in other countries. raghavendra ns: On 29 September 2015 sir we have an query about the EPCG Licence x party applied the EPCG and imported the machinery and x party sold the company to y party now x party has not completed the Obligation now y party can fulfil the obligation with y party IEC...? pls conform at the earliest pls. regds Raghavendra n.s. Bhuvnashwar : On 21 October 2015 Excellent & informatic. Popat Pawar: On 14 November 2015 I am new commer in this field and receintlyi got registered my Pvt.Ltd., firm for marketing. I will be thankful for your valuable guidance in Import/export. Thanks with regard, Popat Pawar. Fazal Ahmed: On 04 December 2015 Respected Sir/Madam, We are group of some people We need to get quite New Export & Import License made from India Government in our North Estate of India (District Unnao: Pin: 209801, India) Do please, guide us at the earliest about how we can be able to get this work completed & very easily from which department of India Government. Please, reply us at the earliest. Thanks with Best Regards, -Fazal & Friends. Santosh Kumar: On 15 January 2016 I am a one year old manufacturer of Hospital bed (ITC 94029010 Hospital beds with mechanical fittings). I have a enquiry from Kenya to sell the Hospital bed on FOB kenya port. I had applied for Export License (IEC code). What is the further process like what documents i need from buyers, Procedure for sending the goods from New Delhi to Kenya, What is the taxes, Custom duty and other charges to be paid in India or Kenya, Who can help me for all these procedure, How can i calculate the FOB cost. ashis chandela: On 29 February 2016 As a beginner , how can i search a buyer of my product in overseas to export . ?? Rakesh Chawla: On 05 March 2016 I want to export herbal product,Ayuvadic products. From where I can know the which products is allow to export or which is not allow. Is any list of wild life in website. ashish kumar : On 19 March 2016 Dear sir How i can find the buyer from all over the world .I am the manufacturer of precisson engineering measurement tools . Arimardan Raut: On 16 July 2016 My Company Export Iron Ore Fines on FOB basis in the Year 2013-14 custom duty at that time 30% on FOB value. At that the Custom Department assessed the shipping bill provisionally and take a PD Bond. Now they required BRC and instruct to pay the differential duty on the basis of BRC. In BRC the company collect Bonus amount over and above the material price and moisture difference. Can they legally right to collect the diff. duty now without final assessment? Ryan: On 05 August 2016 I am a student working on my MBA focused on International Business at Baldwin Wallace University in Berea, Ohio, in the United States of American. I found your contact information on the website 'Howtoexportimport.com'. I contact you today because I see on the website you career has been international logistics. I am working on a project for my international logistics course and I need to determine import, export and transportation requirements for a company to export a product from the country of Mexico and import the product to the countries of Germany and China. I see most of your experience is focused in India, do you have experience in the countries of Mexico, Germany or China? Rahul aggarwal: On 09 August 2016 We are manufacturing unsaturated polyester resin in sonepat. We need to export the product to srilanka. As We are new in export business please help us in solving our problem.our material is exciseable product. Rajat Thakur : On 11 August 2016 We make snacks from Yak milk (Chees) for dogs. We are now planing to export our product to other countries like USA, Canada, South Africa etc. But we are not able to send it as these our dairy product. So kindly if you can help us in that case. Navdeep Singh : On 12 August 2016 I am NAVDEEP SINGH and i am a teenager of age 19. Sir i am interested in doing business in import export merchants. Can u please explain me how to enter this crucial market and how to select a product because exporting a particular product for the first time is very crucial and plays a vital role for me. Hoping for your kind assistance. Jagdeep Singh: On 19 August 2016 Dear Sir, We are into manufacturing of LED Lights, like Bulbs, Tubes, Street lights etc. We have got export enquiry from ACCRA-GHANA. I would like to know how to Export, what Taxes will be applicable at time of export, What are terms and conditions of exports. Please mail us detailed information. Kiran Patil: On 14 October 2016 Hi, i want to sale grapes and vegetables for good rates from direct formars to market.Please help us and guide me to start the activity. pls share me if any dealers contact no in bangalore or hydarabad. Luciano Ripugolomo: On 11 November 2016 i would like export copra. Muthukrishnan Nadarajan: On 28 November 2016 I have a peanut manufacturing company, i would like to export my products too. Please help me if any body has good idea and buyer for it. R S BAGGA: On 29 November 2016 SIR I WANT TO EXPORT NON FRIED, FATFREE SNACKS ITEMS FROM INDIA PLS HELP ME. Thangavelu: On 07 March 2017 Dear Sir, I am newly exporting yarn to USA. I need to know how the L/c might be and what are all the other thing that I have to add with the L/C.Please clarify me get solved my problem. Thanks and awaiting for reply. Thanks. Thangavelu. Sayan Mukherjee: On 28 March 2017 Sir, we are dealing with many types of sarees & salwar suits and sell them to different buyers across India. We are looking for Export business of Sarees. If you please guide us to step into this business. With Regards. Thank you. pratik jain: On 22 May 2017 how can i find buyer for my product in overseas market? kavita more: On 19 June 2017 Dear sir I wish to start export import business, i have no more idea. I request you sir please guide me. Samuel Daniel: On 03 July 2017 Sir, We want to export our Pharmaceutical APIs (Bulk Drugs). Please advise what are the rules and documentations to follow for export. Earlier, we got excise refund on submission of export proof documents. Current new GST Law what to do ? Please advise. rakesh: On 05 July 2017 Sir, We want to export Indian made handicraft like key rings,bags etc. Please advise what are the rules and documentations to follow for export. Current new GST Law what to do ? Please advise. ajay kant: On 11 July 2017 Sir i am manufacturer of Lowers & tshirts..please guide me where i can sell my product. paban ghosh : On 15 July 2017 Let me thank you for the beautiful website which is very handy for the exporters and importers of India. I am writing this mail to you to know a specific information from you. Sir can you tell me if exporting rice non basmati ( Gobindobhog from West Bengal ) has any exporting tax BY THE GOVT OF INDIA on exporting to to Saudi Arabia ? In addition to this, can you suggest which mode of transporting the rice would be less risky and beneficial i.e FOB or CF ? ravi m: On 17 July 2017 I am from Tirupati.we manufacture dairy products like ghee,paneer,khoya.i would like to export my products. But I am not able to find the buyers. Ratan aher : On 24 July 2017 Sir.. I want licence for export the onions from India to any country..tell me details Pls. SAMARESH MONDAL: On 26 July 2017 Dear Sir How I start to export & Import business from india plz assist me ASAP. Atul salade: On 16 August 2017 Hallo sir, How to export fruit. please tell me how to export any fruits. Thank you. Ampusam Symonette: On 30 November 2017 Since hurricane Mathew we have lost our rare fruits trees from our garden which we had imported from Hawaii. But now Hawaii has had some bad weather so we are looking to get some Asian fruit trees grafted from Thailand and want to know if there are nurseries which follow the photo sanitation process etc to import trees .Would love to contact them I live in The Bahamas. Appreciate some facts about the process and procedure. Gagan deep sobti: On 25 February 2018 Dear sir please guide us for export our produced compounded cattle feeds for dairy animals. AMIT PANJVANI: On 21 June 2018 dear sir i am the manufacture of ROSTED GRAM DAL. my product is alredy export by other party. now i wouold like to export my self . can u help me? Abdul Gafoor : On 31 August 2018 Sir, i intend to export pure kashmiri saffron i am fresh And a new comer i have no buyers will u please help me to get buyers for saffron export.